This form is designed for a ground lease of a parcel of land for the construction of a freestanding office building and a biomedical products manufacturing facility by the tenant. The entire new structure will be occupied by the tenant. The form provides that the tenant will be paid a stipulated amount for its improvements in the event of a lease termination which is not caused by tenant default. The landlord retains the right to use the premises as collateral for new financing up to a specified maximum amount. 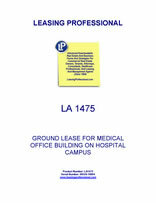 This form is designed for a ground lease of a parcel on a hospital campus for development as a medical office building facility. 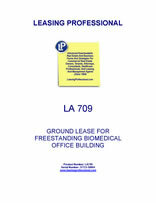 The lease has limitations on the medical procedures the tenants (i.e., physicians and their staff) in the medical office building can offer, so that they will not compete with services offered at the hospital on the campus. The lease is net in character, and contemplates a lengthy term to allow the developer the full benefit of the improvements he plans to erect on the site.